Little Yueyue, victim of the double hit and run, succumbed to her injuries on Friday, but the debate seems far from over. Many people and media outlets are trying to pin down a simple answer as to why 18 bystanders ignored the fallen child. I put out a piece where I argued that the lack of hell may have played a role, but I believe that’s only a small piece of the very complex puzzle. I would still argue that universal human psychology played a predominant role. And I would also argue that the issue is overblown a bit. This video was put together that highlights plenty of instances where Chinese did rush to aid those in peril. When we ignore these counter-examples it makes us susceptible to confirmation bias and overestimating how serious the trend is. And then you have to imagine how many other incidents have played out just like Foshan around the world where there were no CCTV cameras rolling to capture the sickening tragedy. Still, as I noted before, this is just one of many abnormally despicable events in China in recent years. So whether it’s universal human factors or Chinese factors, it’s undeniable that there’s a morality problem. So how can it be addressed? Many have mentioned the idea of a good Samaritan law to protect, or even require, assistance to those in danger. This would be a good step but one has remember the general regard for the law in China. It’s questionable how well this would be enforced in China’s always arbitrary law-enforcement and judicial systems. Still, if some examples of strict enforcement through huge fines or jail time got high level media attention (think Seinfeld finale), it could counteract the Nanjing Peng Yu incident to some degree. I think it’s only a matter of time before the Chinese government realizes what other rulers have known for thousands of years: religion can be a powerful tool to control people and keep public order. Of course, religion has just as much potential for evil as it does good. But regardless of what the government does, religion is going to keep spreading in China. So I don’t know that there’s much to be done on this front. Should morality be taught in schools? In fact, China has an extensive moral education in public schools from elementary through grad-school. College entrance exams have questions testing morality. "Follow Lei Feng's example; Love the Party, Love Socialism, Love the People"
There’s even a holiday dedicated to being a good Samaritan. 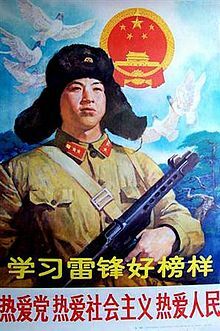 March 5th is “Learn from Lei Feng Day” celebrating the PLA soldier who did selfless deeds like giving his train ticket to a desperate man who’d lost his. The catch with all of this though is that “morality” is usually in the socialist context. Lei Feng implausibly kept a diary with flowery praise of the Communist Party saying he did his deeds for love of the motherland. The rest of the moral education isn’t much different. My girlfriend remembers learning in Chinese high school and college philosophy courses that human beings aren’t born selfish. In primitive hunter-gatherer (communist) societies everyone shared everything and it wasn’t until classes emerged that people became selfish. So the logical conclusion is that socialism lets people be the altruists they were born to be. I suspect this kind of “morality” education gets discarded with all the other political white noise students have to mindlessly memorize for tests, but never actually think about. Protect yourself by agreeing with the social norm, but never BUY INTO IT. I’m not saying this only happens in China, but I have not seen another country where such parenting practice is so prevalent. Correct me if I’m wrong about this. When the Beijing Consensus emerged in the wake of Tiananmen, the basic thinking by the Party was, “We need to get the people rich and do it fast if we have any chance at holding on to power.” This breakneck economic growth has had huge side effects like corruption, wealth disparity and pollution. In China’s face culture, if you’re not well-off now, you’re worthless. This has very practical implications when trying to find a wife or being able to educate your kids in the now ultra-competitive society. So naturally people take shortcuts to get ahead. And with as little government and media transparency as China has, this can be quite easy. The government realizes this and knows that the current growth-at-all-costs model can’t go on much longer. Hu Jintao tried to address this to some degree with his “Harmonious Society” socio-economic doctrine, but obviously it’s had limited success. When the power handover happens next year, the politburo could go the left with people like Chongqing Party Secretary Bo Xilai, who wants to address the problem by maintaining a very powerful authoritarian role and using it to clampdown on corruption and distribute the wealth more equally through measures like subsidized low-income housing. It also includes very emotional measures like replicating the rallies of the Mao era. Or the politburo could go to the right with people like Guangzhou Party Secretary Wang Yang, who appears to want to address the problem by making transparency and exposure of wrong-doing easier through political reform in free speech, free press and intra-party democracy. This could give some much needed transparency and rule of law that would lessen the need, and the ability, to to resort to immoral behavior to get ahead. So it seems politics could improve the moral situation on the ground, but not dramatically. In a morbid way, maybe the best thing that could happen is exactly what happened in Foshan. Tragic as it was, it’s thrown a mirror up in front of China, and really, the entire world. It’s been publicized and debated as much as Peng Yu ever was and will undoubtedly be cited for many years to come. Whether it’s human psychology or Chinese society responsible, it’s shown more vividly than any example in history that people have this fundamental problem. Hopefully recognizing it means they can consciously overcome it. And more practically, the event has highlighted the increasingly universal presence of the CCTV camera, as Kenneth Tan at the Shanhaiist has pointed out. So coming back to Earthly vs. supernatural punishment, I would venture to say that hell hath no fury like an angry Chinese mob with human flesh search capabilities. Update 10/25: This video was posted yesterday which shows Shanghai citizens rushing to the aid of a fallen pregnant woman. Hopefully this is a sign that Yueyue really is having an impact on people’s behavior. Hopefully it lasts. Update 10/27: …and it turns out that previous link was a staged hoax, no further comment needed.